Germany may not back Turkey's $3 billion Ilısu Hydro Dam project because lawmakers in Berlin are not satisfied that Turkey is upholding a pledge to protecthuman rights and environmental standards, Germany's Der Spiegel magazine has reported. Officials from four ministries agreed last week that Turkey's most recent pledge was unacceptable because it did not guarantee environmental protection, a safe relocation of 55,000 people and the protection of cultural treasures, Spiegel said. 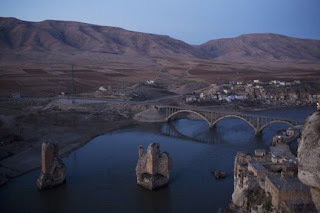 Ministers Michael Glos, Martin Bartenstein and Doris Leuthard, of Germany, Austria and Switzerland respectively, are under pressure from environmentalist groups, as the Ilısu Dam will flood Hasankeyf, a town located along the Tigris River in southeastern Anatolia. Hasankeyf's roots go back 10,000 years, making it one of the oldest cities in human history, reported the Anatolia News Agency last month. The Ilısu Hydro Dam project is part of the Southeast Anatolia Project (GAP) and is extremely controversial. I have written about the project off-and-on throughout my time blogging, but for wonderful portraits of just what is at stake in terms of the human and historical cost of this specific dam, see Carolyn Drake's beautiful photo essay from the Canadian magazine The Walrus. For some of my own posts, including one commenting on lousy coverage by the New York Times (the dam has not been very well covered by international media), see March 13 post and April 11 post. Both contain excellent information from Gareth Jenkins.